I am loving all the amazing Radiant Orchid hues this year. 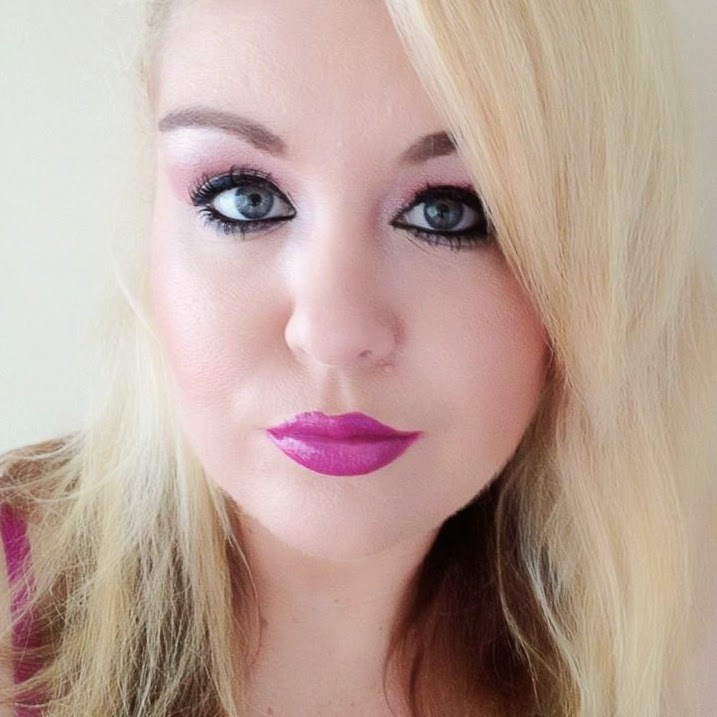 I have a few purple lipsticks including Lime Crime's Airborne Unicorn and Napoleon Perdis DeVine Goddess Lipstick in Selene (don't get too excited - this shade is discontinued now! *insert sad face*). 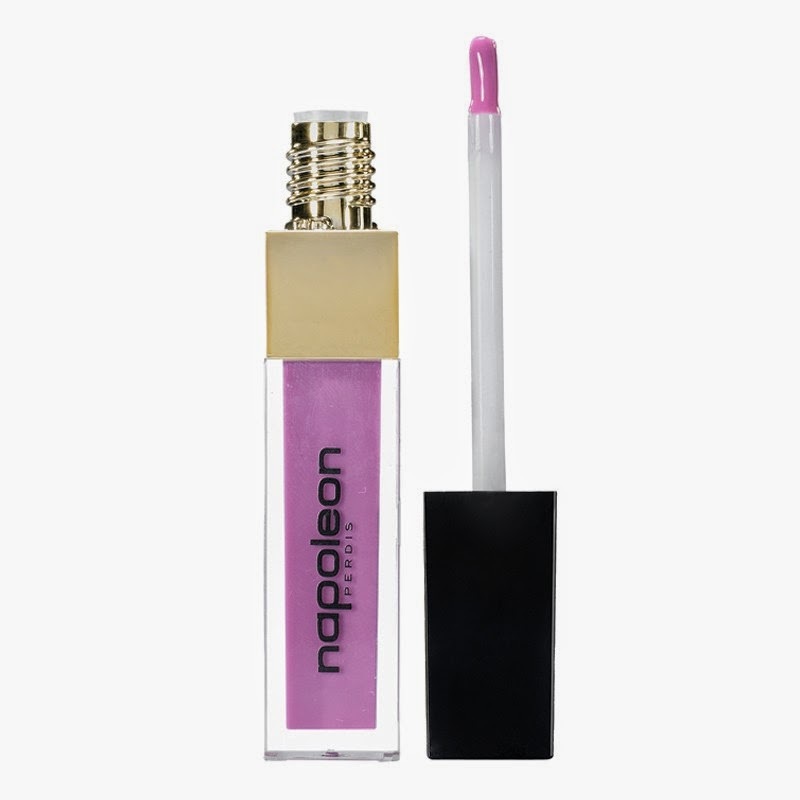 I wanted a new Napoleon Perdis lipstick or lip gloss to create radiant orchid lips. So I thought it best go right to the source - Napoleon Perdis himself. So I sent him a tweet and crossed my fingers for a reply. 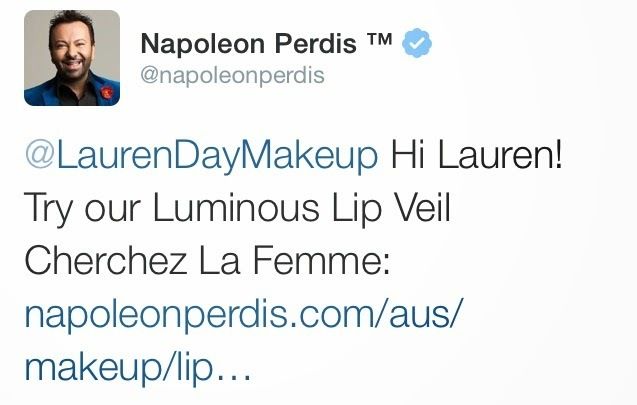 Napoleon suggested the Luminous Lip Veil in Cherchez La Femme. So the next day off I went to my nearest Napoleon Perdis store (my local concept store is located at Pacific Fair) to get this on trend shade. Can I first of all say how much I adore the girls at the Napoleon Perdis stores! They are always so helpful and not too mention stunning!! How do they do that - always look so perfect! Anyway it wasn't long before I found the Luminous Lip Veil Napoleon suggested. Yep that's Radiant Orchid - perfect, I'll take that. Then I spotted the DeVine Goddess Lipsticks. I am so in love with these lipsticks. I already have 3 shades - so why not get another, because you know a girl can never have too many lipsticks - right? Calypso has always been at the top of my Lipstick wish list! They don't have any purple shades in this range - just a lot and I mean a lot of reds! So after trying a few shades on the back of my hand and some helpful suggestions from the NP girl I decided to get Calypso. 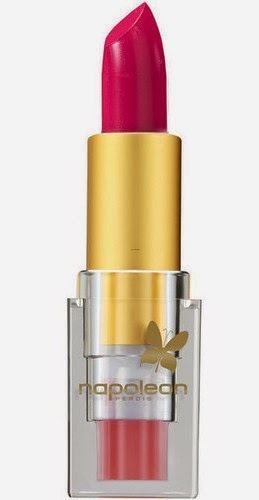 After all I love pink lipsticks and this is the perfect fuchsia. I'm not lying! Of course I had to look at the eyeshadows while I was there… Let me see what new colours do they have - might as well browse the whole range. I already have a few of Napoleon's Loose Eye Dusts. OMG they are AH-MAZING! I love the shade Wild Roses it's a really nice shimmery lilac. The gorgeous NP girl showed me some shades including Violet Femme. Wow it was gorgeous!! I knew I had to have it. 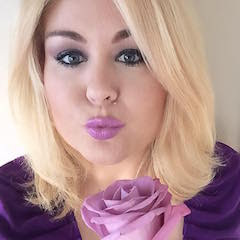 I mean come on purple is the best eyeshadow colour - it looks great on everyone, so I would get plenty of use out of it - right?. Yeah, that's one of those little things that we tell ourselves to justify our makeup addictions! I asked the NP girl who was helping me what eyeshadow she had on! It looked so stunning - hmmmm why can't my eyeshadow look like that?! Anyway she was wearing the Loose Eye Dust in Starlight (I already have that shade it's like gorgeous shimmering sand colour) and the color disc in All That Shiraz. I don't have a single eyeshadow in my collection quite like it. I probably have a colour similar in one of my many eyeshadow palettes but it's not normally a colour I would ever buy on it's own. She told me All That Shiraz looks really great on and invited me to sit in the makeup chair and she could put the colour on my eyes so I could see! I love these NP girls - they know how to sell. (We always learnt in beauty school that once you can get the colour onto a woman's face she is much more likely to buy.) I was surprised how metallic it looked on my eyes. I was just expecting it to look like a dull maroon, but I was wrong. It makes a great contour colour - much warmer than a traditional brown, plus it has a metallic sheen to it. I was sold. This always happens to me - I go into a makeup store to buy one product and leave with a bag full of makeup! It's always the way. When the very helpful NP girl was ringing up my purchase, because I had spent over $50 she introduced me to the Napoleon Rewards program. She advised me if I joined the Glossy Posse Rewards program I could use my card every time I shopped at a Napoleon Perdis concept store and get special discounts. Wow - Yes please sign me up! Next time you're shopping at a Napoleon store - ask them about the rewards program. 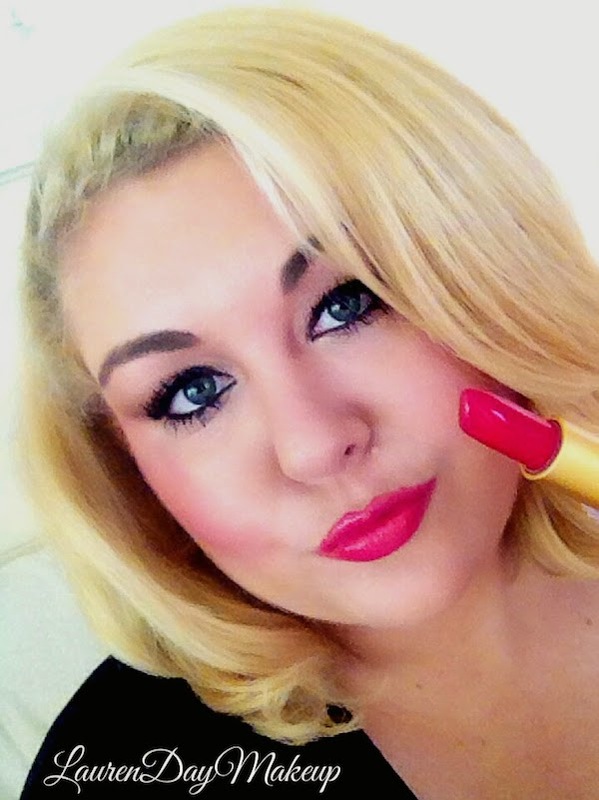 Everyone loves discounts and special offers, especially when it comes to makeup! 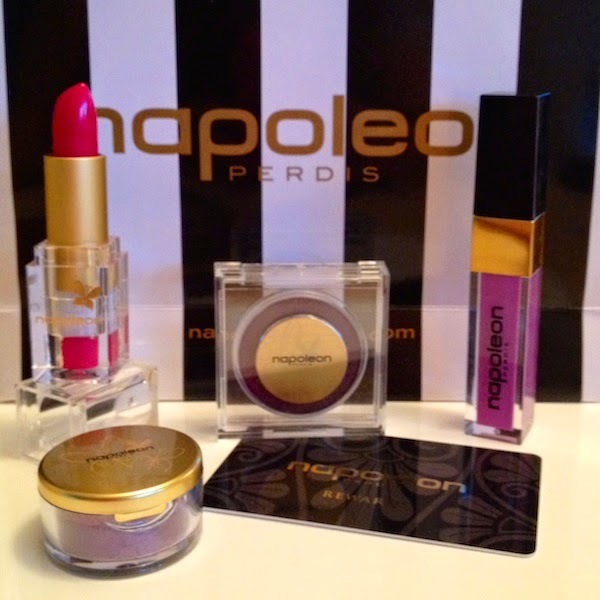 I was so happy with the new Napoleon Perdis items I bought, they will be great additions to my everyday beauty bag for Autumn and Winter. 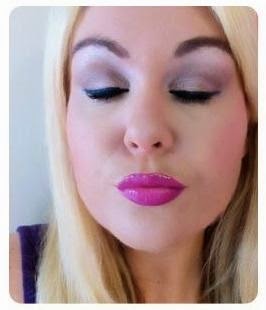 I have already been wearing my new Calypso lipstick matched with the Cherchez La Femme Lip Veil and the Dream lipliner. 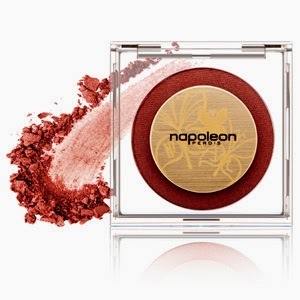 (Napoleon's lip pencils are the best!) I have also been rocking the new All That Shiraz eyeshadow in the crease blended with a little Starlight loose dust on my lid.